For those of you who have been to most of the larger venues in Milwaukee and S.E. Wisconsin, I present to you my list of venues and opinions. 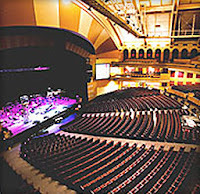 Riverside Theater: I have sat all over that place and my favorite spots are center section, past the first six rows, and the first four rows in the balcony. Side sections ruin the show for me because you can see into the wings. Milwaukee Theater: The first three sections in the center are great. The whole place is great! Marcus Amphitheater: Trust me, move back beyond row N in the center and you will hear a better show. Side sections can be awful. Beyond the lawn, at the top can be cool too. Beer stands are up there. Bradley Center: Skip that place unless you MUST see your all-time favorite band when they come to town. Can you say echo chamber? Alpine Valley: Huge, it's huge, it's huge! But, if the weather is nice, the lawn can be just that. Sleep off the beers while everyone escapes the parking lot, and the show is much more fun. The Rave: I haven't been there since 1998. I hope I never have to go there again. I used to play in that venue quite a bit, but as a paying customer, forget it. It's a trash bin. Pabst Theater: Classy, old, but nice. I'd go there anytime for any show. Hey Van Halen, you are making me nervous!